I thought I’d keep my millennium celebrations to myself, but many friends have asked ‘What was Israel like?’. Israel-the-democracy contains within it Israel-the-theocracy, and this was nowhere more evident than on December 31, 1999. When the entire world was planning to pop corks and fireworks, the chief rabbinate in Israel (ultra-Orthodox affiliated) announced that any hotel that held a party would lose its kashrut certificate – a loss that could significantly hurt future business. In addition, none of the major politicians dared alienate the religious by celebration-talk, risking a loss of political endorsement of the rabbis at next election time. Why were the rabbis so anti-celebration? First, because the millennium is a reflection of the Christian calendar and, second, because New Year’s came out on a Sabbath (Friday night) this year, when observant Jews refrain from using transportation, electricity, etc. The first reason – not commemorating the Christian calendar – is more significant, however, as evidenced by the ban on hotel celebrations in previous years when New Years did not come out on the Sabbath. So Judy and I decided to drive into Bethlehem to catch the action, 10 minutes from our home on the south side of Jerusalem. Residents of the usually sleepy town of Bethlehem, all 22,000 inhabitants, are acutely aware of their place in history, and illuminated the streets and buildings with lights, glitter, and messages of peace on earth. What a difference from the hushed and dark streets of Jerusalem (pop. 600,000), now in the shadow of its little sister next door. We parked a block from Manger Square and had just begun to walk there when a powerful scene unfolded before us. A militant march was heading toward us, led by ranks of kaffiyeh-veiled men, carrying kalatchnikov rifles aloft. This was both surprising and downright scary. We worried that someone would figure out we were Israelis, and not take the time to hear about our politics. Judy and I pressed against the wall as the ranks stomped before us and then passed on, and we scurried off to somewhere less obtrusive. We reached the edge of the Square as the rest of the march passed before us, now rank after rank of torch-bearers, with a huge Palestinian flag held like a tent on high. It was not what we had had in mind for our millennium celebration. We entered Manger Square, now filled to capacity with a mass of revelers, oblivious (I believe) to the political march on their outskirts. Throbbing middle-eastern music blared through the speakers and several young men were sitting on the shoulders of others, curling their arms in the traditional dance movements. The square was surrounded by the churches and grottoes of the Nativity, which felt just as marginal to the celebrations in Bethlehem as they were to the world at large. Indeed, the population of Bethlehem is about half Muslim and half Christian, and I bet they turned out to the Square in equal numbers. A huge TV screen suspended at one end was showing CNN clips of millennium around the world, and a countdown clock was inexorably moving backwards. Judy and I milled together with the mob, trying to avoid the places of heaviest cigarette smoking, but this turned out to be a futile effort. I should also mention that the vast majority of those in the Square were men, and the combination of smoke, male-bastionhood, densely packed crowd, and initial scare made us reluctant to wait the 3 hours more until midnight. From there we drove a short distance to a Chinese restaurant in Bethlehem, and enjoyed Palestinian-Chinese cuisine (the local equivalent of NY-Chinese, I believe). Middle eastern cumin was the spice of choice and eggplant played a starring role. We finished our fortune cookies in time to drive back to a darkened Jerusalem and take up positions on the Promenade (tayelet), with a breathtaking view of the Old City and much of the rest of Jerusalem. Many other Israelis had the same good idea, but there was enough spread-out space for all. In the clear, cold night air, Jerusalem looked its usual magnificent self, unadorned by any millennial jewelry. The famous churches, mosques, and synagogues glowed with self-righteousness, suggesting, as always, that celestial Jerusalem is floating but one inch above its mundane, earthly imitation. As we waited the last few minutes before midnight, I thought regretfully of the 2,000 doves I would not see released in Manger Square and the subsequent fireworks there (I heard comedian Jay Leno the next day call it a planned attack on the pigeons). In the far distance, we could see some lights of Jordan on the hills facing Israel. As midnight approached, several locations around Jerusalem squeezed out something resembling flares rather than fireworks. Bored Israeli soldiers? No, these came from famous Christian sites – churches on the Mount of Olives and Mount Zion. Finally, as midnight struck, spurts of these flares appeared from additional locations, which we made out as Mount Scopus, the YMCA, and locations within the Christian Quarter of the Old City. The altitude of the flares barely broke the horizon. Looking east, we could see flashes of fireworks on the hills of Jordan as well. But the volatile city of Jerusalem was probably the most peaceful place on earth this millennial night. May it only continue. The welcoming of the new millennium closed for us late on New Year’s day. Together with others from the Israeli Committee Against House Demolitions, we joined 2 Palestinian families in the village of Anata for the traditional breaking of the Ramadan fast. The home of one family (Lena’s) had been demolished twice and rebuilt by peace activists. The other home has a demolition order hanging over it. Is this what the new millennium will bring? Breaking bread together, Muslims and Jews, it did not seem possible. Today was Tu B’Shvat, the New Year of the Trees in Judaism. Traditionally, this is the time when the great rains have passed in the Holy Land, and the trees are drinking in the water and thinking about blooming. Only the almond tree actually gets to work showing its flowers, and even this tree holds off on its display for another few weeks during a long and cold winter like this one. But the holiday of Tu B’Shvat is also a political one. Can anything, even nature, be free of politics in the Middle East? On Tu B’Shvat, Israelis plant trees not only to connect with nature, but also because the tree is a symbol of life, of permanence, of ties with the land. One plants a tree where one lives, where one expects to live for many generations, where one is in possession of the land. This how the tree enters the zone of politics. Yesterday, in honor of Tu B’Shvat, tens of thousands of Israeli children and their parents set out to the hills and valleys of Israel to plant trees and declare their connection to the land. Also yesterday, 3 busloads of Israelis and internationals set out from Jerusalem and Tel-Aviv to bring olive tree saplings to the Palestinians who live in the mountains south of Hebron, and plant them together. This was not only an act of fellowship and good will; it was primarily an act of protest. The story began two months ago, when Israeli soldiers appeared with orders giving notice to the 300 Palestinians who live there that they have 24 hours before eviction from their homes. One day later, the soldiers returned and forcibly removed the people from the shacks and caves (sic) where they lived – men, women, children, sheep, and chickens, turning them out into the desolate mountain region. These people are so poor, so disconnected from the urban centers, so marginal to affairs of state, that it took weeks for the story to trickle into town. When it finally did, a query elicited a letter from the Israeli Deputy Minister of Defense which confirmed the story, explaining that the inhabitants were ordered to leave so that the area could be used by the IDF as a ‘firing zone’. That was the official explanation, as if this justified the deed. A press report suggested that this land was promised to the nearby Israeli settlement of Ma’on in exchange for the ‘outpost’ they were forced to abandon…also two months ago. Thus, 300 Palestinians were left without shelter in the dead of winter with their children, sheep and chickens, their other possessions either destroyed or left behind during the eviction. Some went to stay with families in villages nearby. Some have found other caves. Others have no solution. And thus, on the Jewish New Year of the Trees, 3 busloads of us and 100 olive trees made our way to this region, an event organized by B’Tselem, the Israeli human rights organization. As we drove south away from Jerusalem, the land became more barren and inhospitable, with boulders and rocks studding the hills, making cultivation impossible or very difficult. Isolated Palestinian homes or tiny villages dotted the landscape, most of the homes lacking electricity, running water, or other basic amenities. Last night, the temperature there hovered just above freezing, with rain and strong winds. In some homes, the livestock share human space, bringing warmth into the otherwise shivering cold. Perched high above the agrarian Palestinian homes are strategically placed Israeli settlements, bedroom communities tied to Israeli cities, the residents leading suburban lives that are heavily subsidized by a series of Israeli governments that encouraged their presence by tax-incentives, loan funds, and house-building grants. Needless to say, there are excellent access roads, a telephone in every home, electricity, hot and cold running water, a car per family, and a high cyclone fence, sometimes electrified, surrounding it all. Our bus turned one of the mountain curves and met an army roadblock, set up to prevent our passage. We waited for an hour in the cold, gray drizzle as the B’Tselem organizer negotiated with the army commander until a compromise was reached: The human rights activists would be allowed to enter, but the saplings would not. The politics of the tree. So the olive trees remained behind in someone’s car. The mother walked by my side as I carried her child, following the group to where we would be listening to speeches. But she tugged at my arm, pulling me towards the homes, so Judy and I followed her into a poor, one-room structure that belonged to her family. Smoke filled the room as two fires inside made a failing attempt to keep out some of the cold. No door and a bare stone floor made that difficult. The only furniture were two cradles and several simple rugs piled into the corner. This was the home of these villagers, not of the ‘refugees’ from the neighboring village, who now lived in tents or under the sky. Samira was the young mother’s name, and she introduced us to her own mother, who shook our hand solemnly. They opened one of the rugs for us to sit on and I kept Navine with me as we sat down, surprised by how willing she was to have a stranger hold her. Samira poured for us a tall glass of thick sheep milk, which we did our best to sip, but the taste was strange to our palates. Fortunately, the sweet tea came soon after, made from the water supply in a large bucket in the corner. Navine now climbed off me and watched as her mother removed her brother from the cradle and nursed him. She hugged and kissed him a few times, and then got in a poke when her mother was not looking. Grandmother was now praying on a mat in the corner, and we waited until she was done to say our thank you’s and leave. They were very warm, and by now we kissed each other on both cheeks as we left. Outside, the speeches were moving, as Palestinians and Israelis spoke of their longing for an end to the injustice and a beginning of peace. For me they were the usual words, but I don’t think they were ever spoken quite this way before in this village, and never by Israelis. As they ended, my friend Yehudit got bitten by a village dog who seems not to have understood the speeches. Many Israelis were now invited to homes by the villagers, and they enjoyed their own milk and tea. Those who speak better Arabic than I learned that dairy is the primary form of subsistence, as the cheeses made from the sheep milk are sold in nearby markets. The remoteness from urban centers, the simplicity of the lifestyle, the distance from political affairs, make the expulsion of these 300 people so much more senseless and cruel. And thus we parted, determined to rescind the unjust order. B’Tselem had brought some journalists with us, who promised it would be well-covered in the news, and it was, at least locally. A lawyer with us said he had already filed a case with the High Court, and needed public outcry to lend support to his petition, so the Committee Against House Demolitions is planning a series of demonstrations this week. And a collection was taken up to buy tents for those who have no shelter. Oh, and the olive trees. They will find their way to the villagers, who will plant them without us. 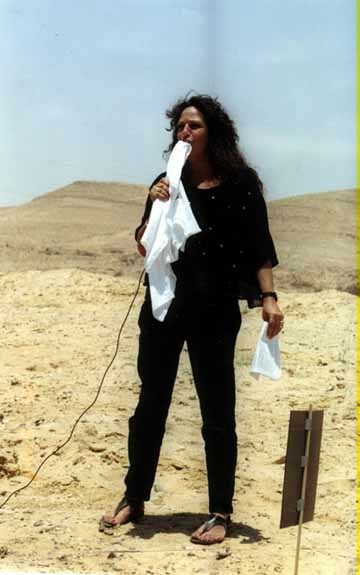 Today I have the sad news to report that Hagar Roublev, one of the most brilliant and charismatic figures the Israeli peace movement has ever known, is dead. She died a few days ago of heart failure at the age of 46. Hagar lived her life with so much passion, so much political vehemence and conviction, perhaps her heart ultimately could not keep up with her. May her sacred work be carried on by all of us. 1. Arik Sharon’s arrogant and provocative visit to the Temple Mount/Haram a-Sharif did trigger the violence, but Palestinian anger was long-simmering and looking for an excuse to explode. The anger is rooted in 33 years of oppression under occupation, and a peace process that has only dashed their hopes. 2. Arafat did not ‘organize’ the riots, nor does he have sufficient control to stop them cold. At best, he can gradually slow them down. The riots were mostly spontaneous and ‘contagious’ during the first days, although by now they have been co-opted by various politicians and street leaders for their own purposes. 3. The reaction of the Israeli forces was aggressive well beyond acceptable needs of self-defense. Some examples: the use of missiles (from both ground and helicopters), the assassination of street leaders by snipers, and the use of weapons, including automatic guns, to quell demonstrations and riots. 4. The demonstrations inside Israel by Palestinians who are Israeli citizens were fueled by two sources: (a) bitter anger caused by years of suffering discrimination, racism, and a refusal to grant them ‘partnership’ in the state; and (b) solidarity with the Palestinians in the Occupied Territories. 1. Barak has much to learn. He is still trying to behave like a war-hero, rather than a statesman. Soon we may have a so-called ‘emergency government’ in Israel, with Sharon the Foreign Minister. It boggles the mind and heart. 2. Arafat may have strengthened his hand among Palestinians by co-opting the riots (for internal consumption). If he unilaterally declares a state in the coming days, he stands to gain even more street support, although it will bring a wave of problems, including Israeli over-reaction in response. The peace camp in Israel is feeling revulsion toward Sharon, Barak, and the iron fist behavior of the Israeli armed forces. This feeling is not very different from the early Intifada days, although today we have many peace groups to organize our actions. There are daily demonstrations by small groups of Israeli leftists, although we have yet to see Peace Now, the largest peace group, call its constituents onto the streets. The theory is that they don’t want to ‘undermine Barak’ because the alternative – Sharon or Netanyahu – would be worse. Tomorrow’s Women in Black vigils throughout Israel will be particularly full. Several emails have been circulating with similar claims – that the Arabs have no right to this territory, that there is no such thing as Palestinians, that Jerusalem is not as sacred to Muslims as to Jews, etc. One such letter came from a man named Farah, and the other from the notably right-wing yeshiva Aish Hatorah. First, it’s true that Palestine did not exist as a separate entity before 1948. However, neither did Israel between 70 AD and 1948. Both, however, exist today and we must contend with the need to reconcile the existence of both. Indeed, Jerusalem was never part of the Zionist dream, and quite marginalized by all the Zionist leaders. Under Ben-Gurion, the Zionist movement agreed to the UN partition plan of 1947, which would have internationalized Jerusalem for 10 years, after which a referendum among its residents would determine the sovereignty of this city. The importance of Jerusalem as a political entity was somewhat revived after 1948, but not fully exalted until fewer than 30 years ago, with the rise of the Gush Emunim (settlers) movement in the 1970s. In short, history is an excellent teacher about what mistakes not to repeat, but not that helpful in resolving the issues of historical rights to this part of the world. More important, in my opinion, is the need to deal with current realities. And if we do that, I think a clear-eyed conclusion has to be that both nations have a passionate stake in this area, and that the fate of both are intertwined. The more fruitful course of action seems to me to find a way to reconcile these claims, rather than seeking to delegitimize one or the other. Considerable attention has been paid recently to the fact that Palestinian teens and even children are ‘sent’ to do battle against Israeli troops. ‘How could a mother send her children to face armed soldiers?’ it has been asked. I would like to share a few thoughts about this subject. 1. Palestinian children do come out in large numbers to throw stones and sometimes even ‘Molotov cocktails’. I do not approve of this violence, but neither a stone nor even a Molotov cocktail is worthy of bullets in response. There are more humane methods to disperse demonstrations. While tear gas is used, Israeli forces too quickly abandon it and escalate to lethal weapons. 2. I am truly incensed by the thought of Palestinian gunmen who fire from within a crowd of children. However, the killing of Palestinian children who are ‘shielding’ gunmen accounts for only a small number of their deaths. Most Palestinian children who were killed or injured were not shielding gunmen. In fact, many were not involved in acts of stone-throwing at all, but innocent bystanders. They were killed because the ‘frontline’ is actually where they live or go to school. 3. Palestinian parents with whom I speak – middle-class, educated – tell me that they and their friends keep their children away from dangerous areas. The children who do throw stones are generally from the poorest of families. This says a lot about the politics of poverty – that the poor are always the ones who end up being cannon fodder, unfortunately. 4. Sadly, the act of sending children off to fight is characteristic of many peoples struggling for independence. How often have I been to our military cemeteries in Israel and seen visitors proudly point to the graves of the very young buried there. In fact, many of the soldiers who are doing the shooting are 18-year old children themselves. 5. Finally, blaming the child or his parents for his death is cruel. The children who were killed did not deserve capital punishment for throwing stones. I think our efforts should focus on stopping the shooting, not blaming the victim. I would like to say a little about the reaction of ‘the left’ in Israel to the violence of the past 6 weeks. In general, many members of the so-called peace camp, particularly those closer to the center of it, have not raised their voices. I am very sorry to report this. This primarily refers to Peace Now as a movement, although some of the younger members of this movement (and several other members) have attended the initiatives of other peace groups. If I may speculate about the reason for this, I assume it has to do primarily with Peace Now not wanting to challenge the position of Barak, in fear of getting a worse alternative – Netanyahu or Sharon. Secondly, I assume that it reflects agreement with the position that ‘Israel has no partner for peace’, in disappointment with Arafat’s ‘failure to control’ the ongoing violence. These positions do not reflect the views of those of us who continue and have intensified our efforts. First, if Barak behaves this way, then he really is unacceptable, and we must replace him with someone else; Netanyahu and Sharon are not the only alternatives. And, second, Israel’s actions have only increased Palestinian hatred and hostility; Israel cannot now claim that it will not negotiate with people who are hostile. While our numbers are still small – until more Israelis recognize that ending the occupation is the only answer – we engage in a wide range and variety of peace efforts inside Israel. Besides the usual demonstrations, vigils, and published petitions, there are condolence calls to the families of Palestinians who were killed, humanitarian aid to Palestinian hospitals and refugee camps, joint Jewish-Muslim-Christian prayer services, ‘peace tents’ set up at roadsides where people stop to express solidarity, soldiers who refuse to serve in the territories and are jailed, and newly formed dialogue groups. The Women in Black vigils have grown substantially (the one in Jerusalem is now about 50 women every Friday, with men who also join us) and reconvened in several cities where they had long closed. Extensive activity is also visible from New Profile, Gush Shalom, Bat Shalom, Rabbis for Human Rights, Yesh Gvul (the conscientious objectors), ecumenical groups, and others. Human rights work continues at a more intensive level than ever by B’Tselem, the Moked, Adalah, Association for Civil Rights in Israel, Physicians for Human Rights, and others. I must also note that considerable efforts are now directed toward a related internal issue – the ongoing second-class citizenship for Israel’s Arab citizens. No fewer than 13 were killed by Israeli police during demonstrations these past weeks, and the very legitimacy of Palestinians as decent, law-abiding citizens of this country is being challenged by many, including Knesset members, senior police, and government officials. Racism is currently rampant on this matter, and we must spare no effort to uproot it. A rally organized last week by the government to commemorate Yitzhak Rabin brought 150,000 into the street. While Barak tried to use this event to mobilize support for himself, I am happy to report that the biggest ovation went to Shimon Peres for his ongoing efforts for peace, over Barak’s objections. Despite all the manufactured signs in support of Barak, they could not prevent the crowd from chanting ‘Shimon, Shimon’. I hope Peace Now took note. Finally, women from all the women’s peace movements have joined hands to work together at this time. I will close with the statement we just issued. The Time for Women Has Come! v We refuse to support men or women who do military service in the occupied territories. v Enough killing and being killed in the defense of settlements! v We did not get our children out of Lebanon so they could be sent to fight for Netzarim and Hebron [locations of 2 Israeli settlements in the territories]. I am not sure you are aware that the conference you will be attending in Ariel is taking place in an Israeli settlement in the occupied territories. By your attendance, you are actually supporting – unwittingly, I am sure – the continued conflict between Israel and the Palestinians. I am hoping you will reconsider your attendance. I would be happy to provide any further information. I’m definitely interested in more information. E-mail is a good way of communicating with me. A word about Ariel. It is one of the largest Israeli settlements, just outside the border of Israel, but very much on land that was confiscated from Palestinian villages nearby. Clearly, its existence is in violation of international law (the Fourth Geneva Convention, which precludes the movement of civilian populations into areas taken by military force). The sponsoring institution, ‘Judea and Samaria College’, was established by the settlers movement in an effort to claim legitimacy by setting up an academic institution within Ariel. As you are no doubt aware from the news broadcasts of the past month, the West Bank has become a virtual war zone, with Israeli forces using gunfire, tanks, and helicopter gunships in an effort to put down the Palestinian uprising, leaving more than 150 Palestinians dead and thousands wounded. The specific area around the settlement of Ariel is no exception; armed confrontations as well as demonstrations and protests, put down by gunfire, abound there as elsewhere on the West Bank. Just two days ago, a 13-year old Palestinian boy was shot dead by the Israeli armed forces at the village of Hares, a few kilometers from Ariel. Moreover, inhabitants of Hares, who spoke to activists of the Israeli peace movement, tell of constant harassment and actual night-time attacks on their homes by Ariel settlers. The mayor of Ariel is Ron Nachman, who has been invited to open the conference which you are scheduled to attend. Mayor Nachman, a Likud Party activist, is famous for two incidents. In one, he declared that foreign workers who enter Ariel must wear badges or armbands to that effect, shockingly reminiscent of the armbands and stars that Jews were forced to wear in Europe. In reaction, many Jewish human rights activists protested by entering Ariel wearing bands that said ‘Foreign Worker’, forcing the mayor to cancel his decree. Second, he announced to the media that if he catches peace activists entering Ariel, he will ‘break their arms and legs’. The Palestinian towns throughout the occupied areas are under ‘closure’ – meaning that Palestinians are not allowed to enter or leave. This includes the towns and villages near Ariel. You would be traveling to Ariel from Israel on ‘bypass roads’ constructed by Israel to avoid contact with the Palestinian population, and undoubtedly under the protection of the IDF. The Palestinians you pass would not be able to use these roads. Indeed, they would need a special permit to enter Ariel, and those employed in the construction and sanitation professions there all carry these. Professor Mendez, if you share the concern that we in the peace camp have about giving legitimacy to the Israeli occupation and the attendant discriminatory phenomena, I would ask you to share this letter with others who might wish to have this information. There’s been an escalation – both in the violence and also the voices for peace. I will not dwell on the violence, since I know you have all read about the horrendous Palestinian bombing of the settlers’ school bus, and the horrendous shelling of Gaza by the Israeli army, and other such actions. But I do want to report on several things that may otherwise not reach those outside the region. The Israeli army carries out numerous ‘acts of occupation’ against Palestinians, from humiliations at border crossings to curfews to exploding the homes, fields and orchards of families whose sons engaged in violence. Yesterday, however, a new form of punishment was inaugurated. The Israeli army bulldozed and destroyed all access roads to Palestinian towns and villages in the occupied territories. And after the roads were destroyed – the torn asphalt a jumble beside the trenches – the army set in place heavy concrete slabs to ensure that no vehicles could pass. This constitutes the complete isolation of Palestinian towns and villages – cutting off access to medical care, jobs, schools, family, normalcy. Doesn’t Barak fathom the enormous anger and hatred that this action sows? The bombing of the settlers’ school bus was shocking, and so were the interviews with the mothers of children who were injured. One mother of 3 small children who were brutally maimed (all lost limbs) explained that this was not her children’s first brush with death, but that she is determined to remain. She said that the children sometimes ask why they must live in Gaza, but now the answer is more clear to her than ever: ‘God gave us this land, and we are on a mission on behalf of all the people of Israel.’ Not on my behalf, may I clarify. Clearly there are some Israeli mothers in a cruel counterpoint to any Palestinian mothers who send their children to the front lines. By the way, the settlement of these families yesterday confiscated and annexed even more land in Gaza. For perspective: The Gaza Strip holds 6,000 Israeli settlers in a sea of 1.2 million Palestinians, meaning that the Israelis represent only 0.5 percent of the population there...but they control 40% of the land. The remaining tract is second in population density only to Hong Kong. The predominant voice heard in Israel these days is that of the extreme right wing, and their latest slogan is ‘Let the IDF win’. The meaning, of course, is to get Barak to unleash the full force of the army against the Palestinians. Other voices are also heard, especially that of the women’s peace camp. Women in Black are now standing in vigil at 3 more locations (Haifa, Nazareth and Acre) in addition to the vigils that never stopped (Jerusalem, Tel-Aviv, and Nahshon). More are in formation in the Beersheba and Kfar Saba-Ra’anana regions. Yesterday, in an astounding show of unity, Jewish and Palestinian women – all Israeli citizens – held a joint peace action in the Arab heart of Israel, Wadi Ara. This region was the location of demonstrations that became bloodbaths in early October, as the Israeli police shot at Arab demonstrators to stop the stone-throwing, killing 13. After the street protest, the women jammed a hall in Umm al-Fahem, the focus of the prior unrest. Outside, the destruction of the previous month was still starkly visible – broken street and traffic lights, debris everywhere. Weeks later, the traffic and utility companies still have not fixed these. But inside, the Arab proprietor donated coffee and baklava to the whole crowd, and we listened to speeches in Arabic and Hebrew of women committed to equality and a just peace, and pledging to instill these values in our children. It was a sweet moment of reconciliation for us all, and we are determined to nurture it into a fully blossomed peace. Many Israelis spoke in support of these concepts, including Uri Avnery, Latif Dori, Moshe Amirav, Yehudit Harel, and virtually everyone. The other senior Palestinians present spoke similarly: Ziad abu Zayyad, Ahmed Ghneim, and Dyala Husseini. We knew it would be a difficult vigil because just this morning, a woman settler, mother of six, had been shot to death in a car near her settlement just outside Hebron. The killing of Israelis is always an occasion for the right wing to seek scapegoats among the left, and today was no exception. This was aggravated by the fact that the settlers decided to drive the funeral procession past the prime minister’s home in Jerusalem – one block away from Women in Black, and exactly during the vigil – between 1 and 2 p.m.
Just as we women gathered at the plaza, the settlers also appeared, many armed to the teeth – revolvers in their belts and rifles over their shoulders. They began by hurling verbal abuse – she was killed because of you, you orphaned the children, you are the murderers, didn’t the Holocaust teach you anything, and the popular ‘Kahane was right’. (Kahane was the racist rabbi who called the Arabs dogs and demanded their death or exile.) We knew enough not to answer them, but they could not abide the silence of our vigil combined with our signs – ‘Dismantle the settlements’, ‘End the occupation’, ‘Return to the ‘67 borders’, ‘Sharing Jerusalem’. They began to grab our signs, rip them up, and push some women off the ledge. There were only 3 police at that time, and the settlers, now joined by the Kahanists, became uncontrollable. Some women were injured, but not seriously. More police arrived, and the fighting spilled over onto the streets at this busy intersection, as the police tried unsuccessfully to subdue the more violent ones. Most of the blows were exchanged between police and settlers/Kahanists. As the violence was peaking, the funeral procession was massing a block away, and we knew that we were like standing targets on the vigil plaza. We decided quickly among us that we would not leave, but that we would lower our signs before they passed us. Some women disagreed with this quick decision, but there was no opportunity for discussion as the cars approached and turned alongside the plaza. They would have to travel about 15 meters (45 feet) along the line of women, when we would be no more than 3 meters away from them. We stood in silence, without signs, but making a very clear statement as the leaders of the group drove by – Levinger (himself convicted of killing a Palestinian in Hebron, who served 6 months (only!) to pay his debt to society), Noam Arnon (the spokesman of the Hebron settlers, who got out of his car to tell the media that the presence of Women in Black was a ‘provocation’), and Geula Cohen (who was a member of a Jewish terrorist organization prior to 1948), as well as cars filled with weeping women and children. My heart grieved to see that. The progress of the motorcade was constantly interrupted by settlers/ Kahanists who jumped out to come to blows with the police who now formed a cordon separating us. It was clear that the police were taking the blows that were intended for us. And they kept this up until the last car finally passed out of sight making its way to the cemetery. Thank you, Jerusalem police. I wonder how the media will frame it on this evening’s news. Allow me to pre-empt them: Today, as every Friday for the past 13 years, Women in Black throughout Israel maintained their vigil calling for an end to the occupation and a just peace with Palestine. The Jerusalem vigil of about 100 women stood quietly as a large crowd of armed settlers sought to threaten and intimidate them. It did not work. Yesterday, Israel saw the largest rally for a just peace that has been held since the outbreak of the intifada 3 months ago...and it was a joint Israeli-Palestinian event. Women came in droves from all over Israel – Jewish, Muslim, Christian, and Druze. And despite the ‘closure’ that Israel had imposed on the Occupied Territories, Palestinian women and men also managed, by means only they know, to cross the Green Line and reach us. The day began in the Notre Dame conference center located symbolically on the border of Jewish and Palestinian Jerusalem. The walls carried two huge banners in Hebrew and Arabic: Women Demand: No to Occupation – Yes to a Just Peace! We opened with greetings from three international women peace leaders who flew in especially for the occasion – Luisa Morgantini from Italy, Simone Susskind from Belgium, and June Jacobs from the U.K. The co-moderators – Hannah Safran from Women in Black and Nabeha Murkus from Tandi – reported to the crowd about solidarity demonstrations being held throughout the world, and of greetings from organizations and individuals from a long list of countries. Women then took the podium one by one, Palestinian and Israeli alternately, to speak movingly and passionately of both the suffering as well as the determination to end the bloodshed between our peoples. This was a conference ‘of the people’, but we were glad to see in the audience 3 Israeli MKs (Tamar Gozanski, Naomi Chazan, and Muhammad Barake) expressing their support for the grassroots work. The simultaneous translations into Hebrew, Arabic, and English allowed each woman to speak in her own language. I will just quote two: Michal Pundak-Sagie, activist in New Profile, called upon soldiers to refuse orders that their conscience does not allow. And Zahira Kamal, leading grassroots spokeswoman in the Occupied Territories, declared that the principles of the Coalition of Women for a Just Peace provide a sound basis for peace between our peoples. 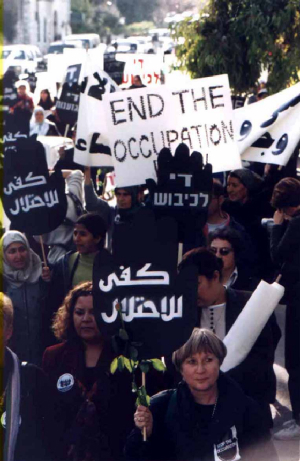 From the conference center, waiting buses moved the entire crowd to Hagar Plaza, the location of Jerusalem’s Women in Black vigil, and an estimated 2,000 women filled the entire plaza and spilled over onto the side streets carrying the traditional black hand signs with ‘End the Occupation’ painted in Hebrew, Arabic, and English. This silent one-hour vigil was an even more dramatic sight than usual, and TV crews from all over the world – even from Israel – were there to capture it. The extreme right wing did their best to infiltrate the ranks, to provoke us and draw attention to themselves, and finally ended up exchanging blows with the police, but they were overcome and moved behind barriers – out of sight, mind, and media. At 2:00 pm, the crowd poured out of the plaza and from every corner and side street, we began our march toward East Jerusalem. Men and women who had joined us from other organizations – Gush Shalom brought its own busload of activists – held aloft their own collection of banners and signs for peace. The sight was overwhelming, as the street filled with marchers and voices. Nabila Espanioly from Nazareth grabbed a megaphone and led responsive chanting: ‘Peace?’ ‘YES!’ – ‘Occupation?’ ‘NO!’ doing renditions in Hebrew, Arabic, English, and even Italian for the delegation of 35 who had flown in for the action. Flying high were signs and banners saying ‘Palestine Side by Side With Israel – On the ‘67 Borders’, ‘Jerusalem – 2 capitals for 2 states’, ‘The Age of Generals is Over’, ‘Fund the Poor, Not Settlers’, and ‘We Refuse to be Enemies’. It was breathtaking to be part of that march. But the moment that brought tears to my eyes was when I greeted a man being pushed in a wheelchair beside me, and asked if he wanted to hold a sign. In response, he unbuttoned his collar and pointed to a deep scar just below his neck. The man pushing the wheelchair explained: ’We’re from Hebron. This is one of the victims of the massacre by Baruch Goldstein. He wanted to join you today.’ A victim of the violence who harbors no hatred in his heart. I shook his hand wordlessly. As we finally all assembled in the park beside the ancient walls of the Old City of Jerusalem, people spread out on the grass on this unusually warm and sunny winter day, exhilarated and awaiting the closing ceremony. Because of the traffic jams we had caused, the sound system had not yet arrived, but the crowd waited patiently. Meanwhile, four brave young women took banners and actually managed to climb to the top of the wall from inside the Old City – some by stairs, but also by one quite daring leap – and made their way to the top of the wall just over our gathering, beside two armed soldiers ‘protecting’ us. From here, they unfurled four banners down the height of the wall saying Shalom, Salaam, Peace, and End the Occupation in the three languages. The crowd roared its approval and the Old City was crowned the city of peace for one brief moment –until the soldiers assaulted two of the women and their banners. The women wisely threw the other two banners down to the crowd – to save them, and probably themselves, too. But that was a great moment in modern history. Thank you Naama, Tali, Moran, and Micheline. Finally, the sound system was set up, and Halla Espanioly spoke movingly of our longing for peace. Nabila called for a minute of silence in memory of all those who had been killed in recent months, and the stillness in the crowd was palpable. Following this, I made a slightly modified Jewish prayer: ‘May the Divine Presence give strength to all her peoples, and may she bless all her peoples with peace.’ And we all ended by singing ‘We Shall Overcome’. There is much to do to turn this moment into a revolution. We invite all of you to join us. Thank you for your comments to this sentence. I debated with myself at length and rewrote it many times before deciding on this version. Clearly, I still did not get it right. I had hoped that the word ‘any’ would mitigate the number of cases that happen on the Palestinian side, as I certainly do not want to imply that it is a general truth. I did not mean that most send their children off to battle; certainly most do not. But there has been a sufficient number of cases, many tragically documented on TV or in email that I received (from Palestinians) of Palestinian mothers who do send their children off to do battle. In the e-mail I sent, it was my intention to point out to those who accuse Palestinians of using their children as cannon fodder that Jews do it too. I did not mean to say that ‘most’ mothers on either side do it. But there are enough such mothers and fathers on both sides to make it shocking and tragic.